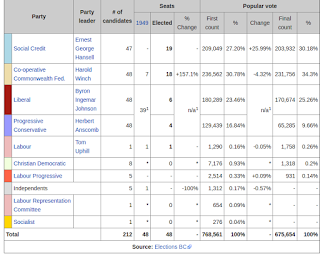 As you see, the CCF in fact won the first round votes in the electoral system used at the time. 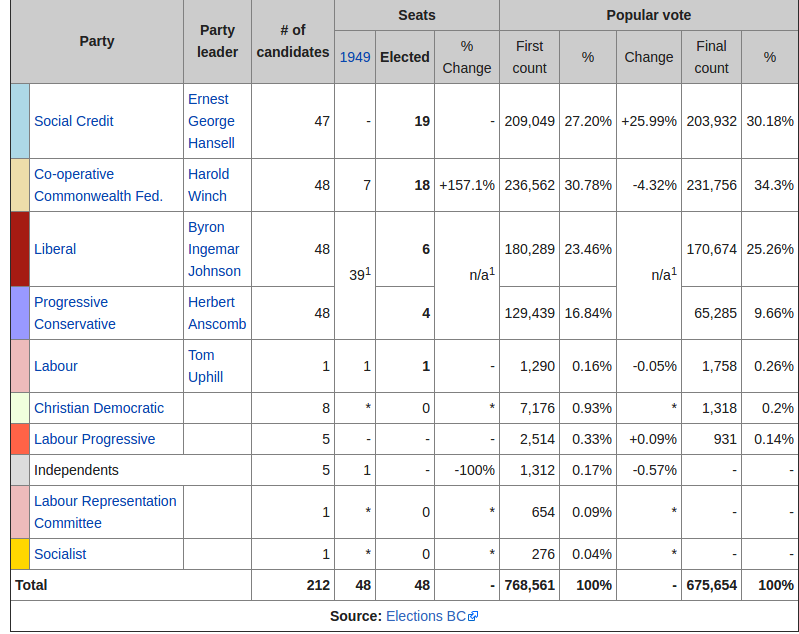 Under first-past-the-post, BC would have elected its first CCF government in 1952. But BC used alternative voting, or ranked ballots. The thought was that Liberals and Conservatives would preference each other and keep the CCF from office. But what did happen was that the previously small Social Credit party became the alternative choice for supporters of the more established Liberal and Tories. From zero, the Social Credit party became a compromise coalition party that would govern BC for the next 20 years. Why is this relevant today? Because the game of playing NDP vs Green off against each other failed to produce the results the BC Liberals (modern incarnation of the old Social Credit party) had wanted. Worse, if the electoral system changes to a kind of proportional system, that 57% would render the right-of-centre the minority voice in BC that they are. The world has changed, and when every vote matters, and every vote counts, the powers of regression and backwards are a minority voice. Progress and forward is the future. This is not to say that in the future that the Green Party *will* form governing coalitions with the NDP. Or that the NDP will always lead the ballot in such an arrangement. Green and NDP votes are not interchangeable, they're different parties for a reason. But a change in the electoral system also changes the game. Parties will be forced to campaign on issues, not fear. Parties will be forced to work with others and stop being so overtly partisan and divisive as they have in the past. Christy Clark is arguably one of the most polarising, divisive, partisan politician BC has ever seen. Folks either love her or hate her. But whatever you think of her, she had no choice but to try to thwart the NDP from taking office by any trick available to her. She knows, and high powered BC Liberal thinkers know what happens if the voting system changes. The BC Liberals are already a self contained coalition party, while the NDP or Greens are not. 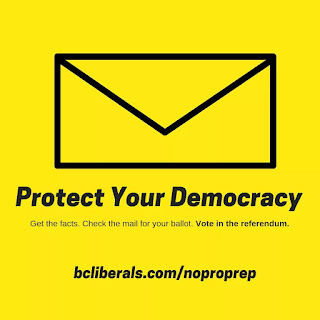 But in a proportional system that gives representation to parties based on actual voting percentages, the coalitions needed to move BC forward will be forced to come out into the open instead of what goes on in the backrooms and boardrooms of the mighty BC Liberal Party. The full electoral strength of parties that share some common ground but aren't the same would be a sight to behold. Deal making and compromise would take over from bait-and-switch. BC would benefit. The voter would become more powerful than the politician. There's no telling what the 2021 campaign will look like under a new system. But that's a campaign that would be far more fun than the fear and loathing campaigns of the past.